What part of FLAT EARTH don’t you understand? 114,000 feet (21.5 miles, 34,747 meters) High Altitude Balloon Footage shot with a 120 degree wide angle lens (corrected) … music “The Sound Of Silence” song by DISTURBED. Posted in Flat Earth [in English] | Commenti disabilitati su What part of FLAT EARTH don’t you understand? Why would the powers that be want to hide the true shape of the Earth or true model of the Universe…why? 2. To take God out of the equation of life. 3. To hide our divinity or divine importance. 4. To hide mankind as the center of the Universe. 5. To promote the “Space Myth” for profit, keeping all the space programs going all over the world. 6. To Create a fear based world, comets hitting us, the ball Earth blindly hurdling through space. 7. To perpetuate the profit of Dinosaurs and the scarcity of oil so called fossil fuels. 8. To keep Darwinism and the Big bang as current truth and not pure theory. 9. To hide whats beyond the arctic ice wall. I have been having fun looking into the flat Earth round Earth debate, approaching the whole discussion with a complete open mind not being one or the other, after many hours of research from a scientific perspective here is my findings. I am not round Earth and I am not flat earth I just want to know the truth, and the observable evidence based on Reason and sound Logic points to a Flat Earth. If I am pressed to choose I will go with the evidence not sentiment. The Earth is Flat. Makes you wonder why there is a flat earth debate when we have photos and video from thousands and thousands of feet up and no curve? Should be enough proof? In fact we can’t find curve anywhere on land or from space. Round Earthers please notice the graduating light source on the horizon and above it (from posted photo), notice the obvious hotspot because of the closeness of the Sun and the dark edges where it is becoming night as the light dissipates. Its not that people want the Earth to be flat, its just that the evidence of such is overwhelming. 2. No Curve from Land….no observable curve nor measurable curve from high powered lasers or any other measurement known by man. 3. For all the moving, spinning, tilting and wobbling of NASA’s model the Polestar stays fixed, year after year millennium after millennium. Not only is the Polestar fixed but so are all the stars, ALL OF THEM. Proof is in the time-lapse of the stars at the North-pole. 4. The graduating light source of the Sun as it sets at the horizon, light follows the Sun, why? because the Sun is moving and not fixed. This graduating of the light source is not how NASA admits or views the Sun, if the Sun is Fixed at the Center of the Solar system its light would not gradually diminish following the Suns path across the Earth. 7. Commercial flight paths and boat paths are all flat earth based. 8. The Sun and Moon are out in the day time at the same time high in the sky…and the Moon is at all stages of its phases, If you can see the Sun in Full then the Moon should not be a Crescent ever, if the Moon is a Crescent then the Sun according to NASA must be on the other side of the earth casting a shadow on the Moon not high in the sky with the Moon. 9. Water is always flat, always. There is no such thing as curved water. 10. The Sun at any given day will be sometimes 20% or more bigger depending where it is in the sky, impossible if it is fixed and 93,000,000 miles away. The relative size would not change much at all at such distances. 16. The Horizon is always at eye level, no matter how high you go, this is impossible on a ball Earth or any Ball for that matter. When your at sea level the horizon is at eye level, when your at 130,000 feet in the air it is at eye level. This only happens on an infinite plane or a very huge!! plane, but would not happen on a round ball. I’m not a mathematician but if at 130,000 ft and the horizon looks flat, and they say we are on a ball, how big would the earth have to be to incrementally round out the flatness to be a ball…I think the Earth would end up being millions of miles around or even billions of miles around?. 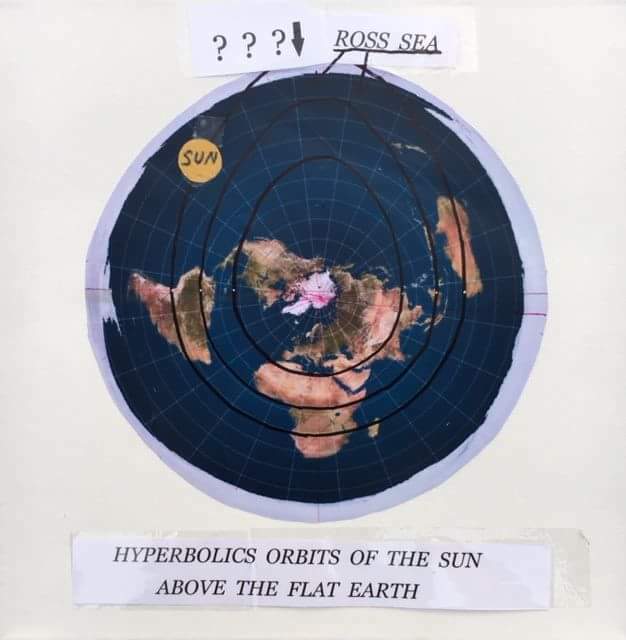 The horizon is always at eye level and it spreads out into infinity in all directions that is why NASA and private photos of earth always show the half Moon depiction of Earth from space, never panning to show the actual ball Earth. Look at all the photos of the Earth from space if its a real photo and not CGI then it will always be the half Moon depiction with a GoPro Lens like curve. If its really a Globe why can they never video or take pictures from so called space panning and showing us anything but the half moon shot. The reason is the horizon rises to eye level and goes off into infinity in all directions and is impossible to show anything but the half moon gopro like shot. All else is CGI if they show anything but this perspective. 17. NASA admits on several occasions they can only fly in lower earth orbit, the key word here is fly, nothing has ever orbited or floated weightless outside lower earth orbit, outer space does not exist, the entire world lives under the firmament, there is no actual proof of going through the Van Allen Belts or Firmament, only Gods Sun, Moon, Stars (clouds) and other heavenly bodies float weightless fixed in their path or position, all other bodies must adhere to the law – “what goes up must come down” here are the links from NASA themselves again admitting this truth –https://www.youtube.com/watch?v=Ci-nOZb9XmM andhttps://www.youtube.com/watch?v=NlXG0REiVzE. Posted in Flat Earth [in English] | Commenti disabilitati su Flat Earth What?? Why spend your hard earned money on expensive brands like PUMA, if you can get the chinese knock-off NUMA, TUNA, PIMP or PIGG much cheaper? Also, why spend a fortune on faking space with NASA, ESA or Roscosmos, when CNSA – the Chinese National Space Administration – can do it for just a fraction of these budgets? Just take a look a China’s “Space Walk” 2008: They filmed it in a pool, just like the BIG space agencies, with the same telltale signs; bubbles in “space”, Astro-Nots (Taiko-Nots in this case) and objects like their chinese flag and the security cable figthing against the water current. The globe projection in the background glitches and the whole earth changes from partly cloudy to completely clouded in a few seconds. For a few extra bucks, the chinese space-actors even throw up a salute to the devil showing the horned one hand-sign, jut like their overpaid counterparts. Or here, China’s space station Tiangong-1 in 2013, the same green screen glitch we have seen from NASA and ESA so often, people don’t just appear out of thin air, yet this Taikonot does exactly that. First you can see right through him, then he gets more and more solid as he enters the module. 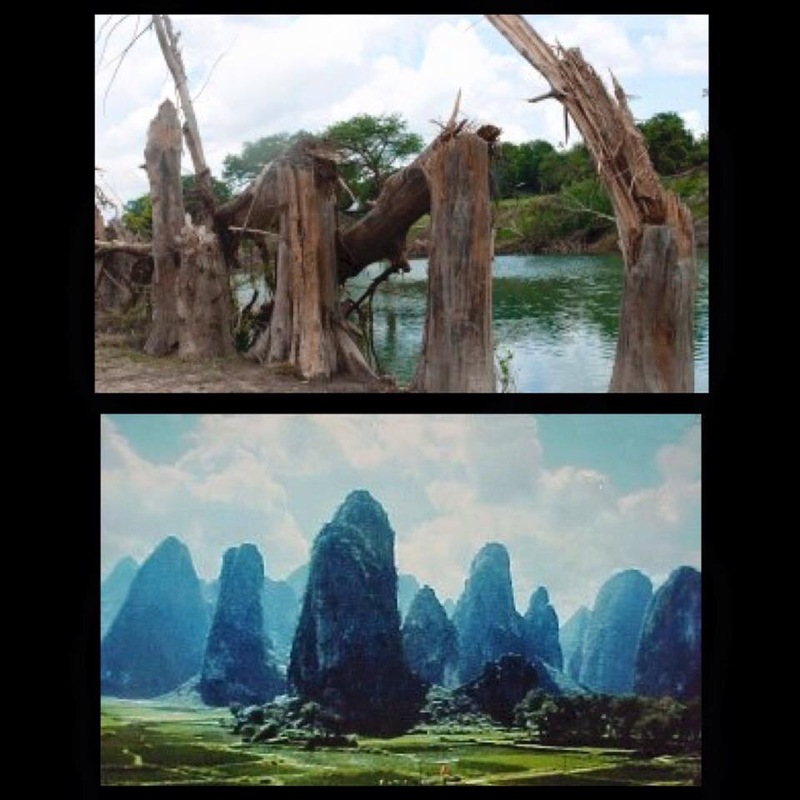 And why go to NASA for alleged landings on Mars etc, when China’s CGI nerds can do it just as good? Granted, the chinese moon-cartoon-landing 2019 looked like it was programmed on a Playstation, but the brainwashed masses don’t notice stuff like that anyway, so why bother making it any better? Critical thinking is as good as dead in our societies, and as long as the main stream propaganda machine claims it’s real, most of us will buy it hook, line and sinker. In case you didn’t note the sarcasm in my words, I am really sorry for you, and I hope and I pray that you will wake up from your deep slumber before it’s too late. If you are one of the many guys calling me a mentally retarded lackwit idiot who should quickly kill hilmself, I am sorry for disappointing you, but I will do nothing like that, I will go down fighting for the truth and not like most of you giving up and defending a giant heap of satanic LIES. NASA and ALL other space agencies LIE, Space is FAKE, Biblical Earth is FLAT, God Almighty is REAL, and Jesus Christ is our beloved Lord and Saviour. Flat Earth and the 7 Planets of the Universe by ODD TV. The number seven encoded in our universe. Epic views of Baja California and the Sea of Cortex in infrared. Baja is clearly visible from around Tucson and Phoenix Arizona aboard a flight from Los Angeles CA to Houston TX filmed in infrared with a Sony ax53 camcorder and 950nm long pass filter. As my other videos show, infrared lets us see very far, in fact too far for a globe. The earth appears FLAT! 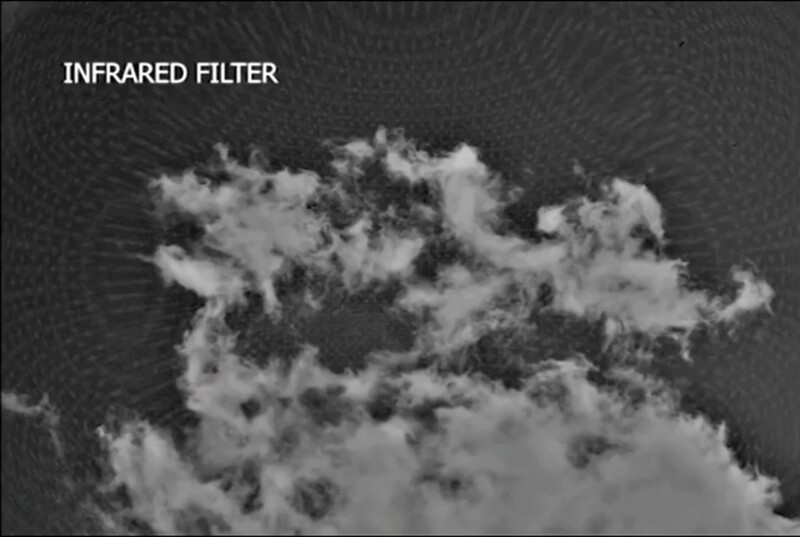 The Firmament shown in infrared? Fair Use for educational purposes. Original video https://youtu.be/pC0MyG9FvBE If you have an infrared camera, pls take footage of the sky and try to capture the Firmament on clear days. Posted in Flat Earth [in English] | Commenti disabilitati su The Firmament shown in infrared? Just when you thought you had heard the most ridiculous flat earth theories, reality TV stars wade into the debate. Yes, we know that there are a few celebrities who have come out as Flat Earthers in the past. but the stars of Geordie Shore may have just topped everyone with their thorough analysis of the shape of the planet. 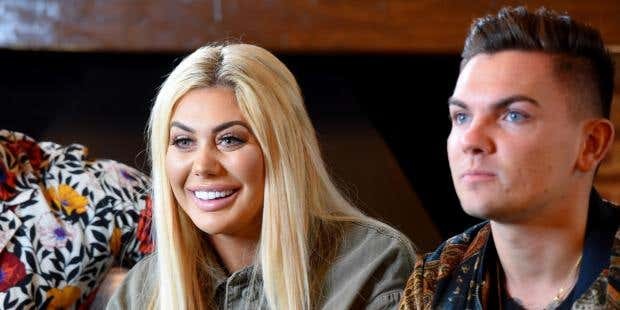 Speaking to The Daily Star, Sam Gowland and Chloe Ferry – both stars of the popular reality show set in Newcastle – admitted that they became flat earth believers after a flight to Australia. I’ve got a theory. They say the world is a circle but I think it’s flat. For instance, when has anyone ever walked or flew and suddenly gone down? That never happens. Even when you go to Australia you go straight along. We can see the logic here, ish – but honestly the notion that you should have to fly directly down in order to reach a country in the southern hemisphere defies all the physics we know. Sam, who has also appeared on Love Island, continued by adding that flying back to Australia would require you to carry on flying around in a circle and not go back the route that you came. 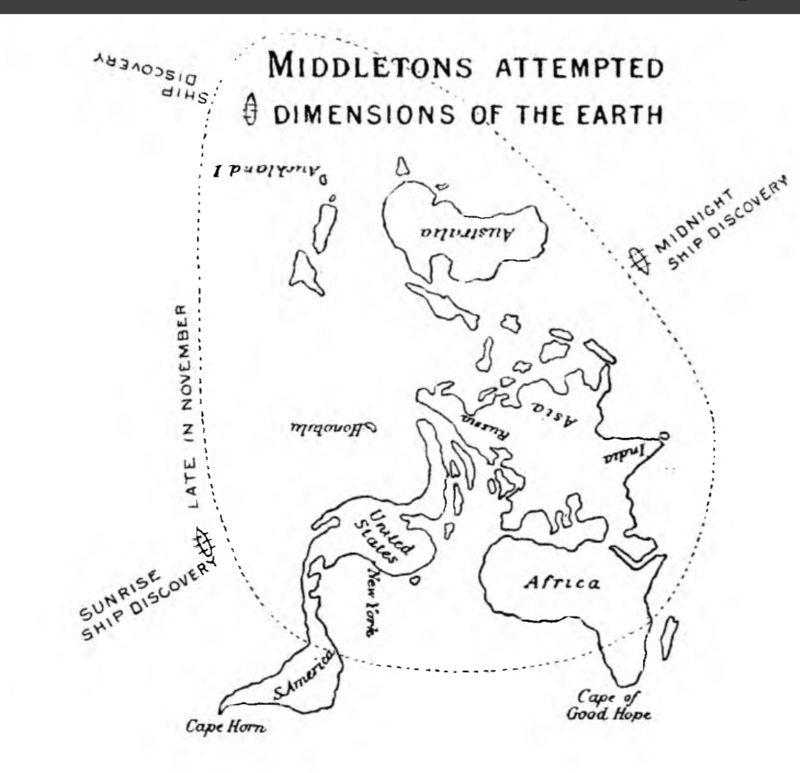 I’m being deadly serious…if the world was round then when you flew to Australia you’d have to go at a downward angle. But it doesn’t. Also, if the world was round then when you came back from Australia you could just carry on round. But you don’t…you go back the way you came, through Thailand. Sam also struggled with the concept that the Earth orbits the sun, the movements of clouds and how you aren’t upside down when in Australia. In addition, Chloe – spoken like a true conspiracy theorist – believes that scientists have been lying to us about all sorts of things. I think the scientists are lying. They lie. The world is not round. They lie to us about loads of stuff. People who understand it should work for Nissan…sorry, I mean Nasa. I’m also confused about the Bermuda Triangle. I struggle to even say it. The thing about the Bermuda Triangle is no-one knows what’s going on…I want to know what’s in there. Although it is easy to mock Flat Earthers, we can’t begrudge someone for wanting to believe in something. A major flat earth theorist Connor Murphy recently told UniLad that Flat Earthers don’t like to feel that they are being controlled and told what to think by Nasa. The money raised by NASA alone since their inception is something like fifteen trillion dollars, and with that money, they’ve really shown little for their work. They’re releasing composite images and articles and telling you this is what’s happening, this is what we’re doing, and we spent seven hundred million dollars to get this photo of Pluto that we had to put together in Photoshop. A second thing is to make people feel insignificant. It makes you feel like you’re an insignificant speck of dust and therefore you’re easy to control. With that being said, we cannot state this any more clearly… the Earth is round. Drew Barrymore on “Norm MacDonald has a show” . She mentions the flat earth “it’s flat, it’s round, I was in a dome“. 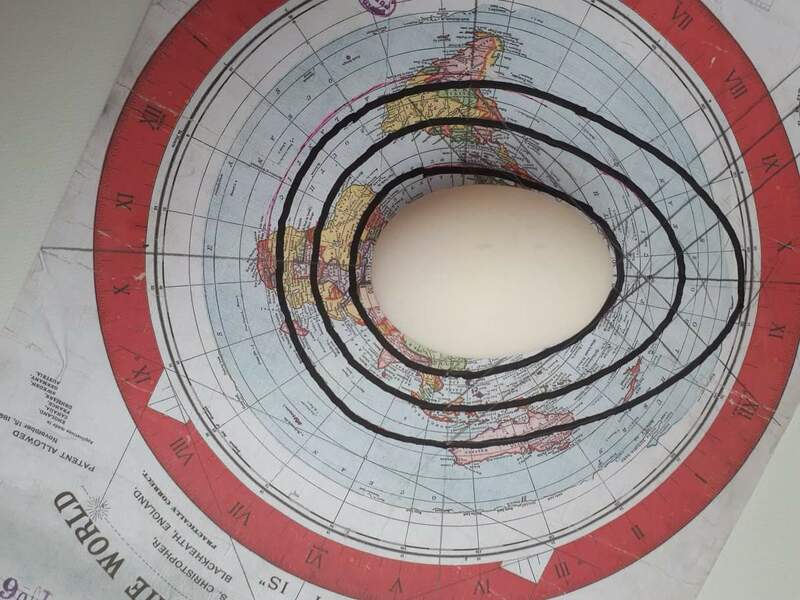 Flat earth researcher Calogero Greco has developed an innovative model. In this Earth model, the Sun draws in an oval-shaped orbit over the face of Earth. Mr. Greco noticed that, during Austral summer solstice, the sunrise point in South Africa is different than Australia and New Zealand. In fact, in Africa the Sun raises from North East while, in Oceania, it comes from South East. Being on the same latitude, it is quite odd. Therefore, solar path must not be circular but rather elliptical. So Calogero established a model to settle the issue. The oval shaped solar motion suggests that a portion of Antarctica may be warmer than currently believed. So, it may be confirmed Admiral Byrd allegations regarding a warmer unknown land existing beyond the South Pole he had discovered during his antarctic expeditions. Even James Cook said he had seen lands free of ice beyond the Ross sea. In this territories may have survived animal and vegetal forms gone extinct elsewhere. 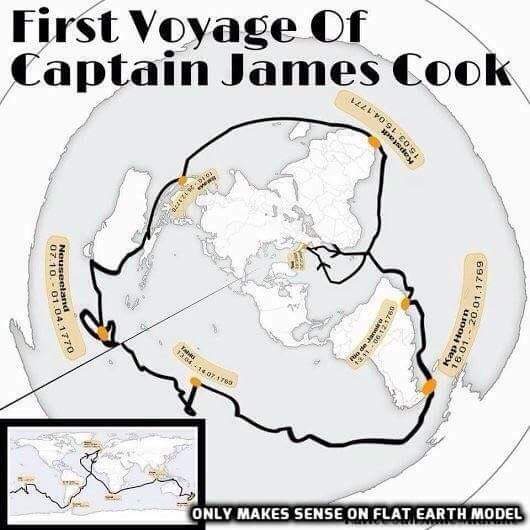 Calogero Greco also discovered the mentioned explorer captain James Cook, during his Southern explorations, followed the sun having it on his vertical during the month of November. The motion of sun spots show us that the heliocentric model has a serious problem. What we observe in reality does not match what we are told. RESEARCH FLAT EARTH! Special Thank You to all those who contributed to this project. Tony Russo, Anderson Neves, David James, and Chris Monk Sellye. If you are 40 years or older, you may remember January 28th 1986. It was the day of a huge NASA catastrophe off the coast of Cape Canaveral, Florida, where at 11:38 am EST, 73 seconds after take-off, Space Shuttle Challenger exploded in a tremendous burst over the Atlantic. Now, for a second time this matter leaves the world breathless. Though, this latest shock even surpasses the one of 30 years ago. At least six of the seven Challenger crew members are said to be still alive; four of them even under the same name. Further readings: Was Gregory Jarvis the only victim of Challenger disaster? it’s a recent discovery that passenger airplanes do not carry much fuel, technological achievement being hidden from public eyes. You won’t believe this. I’ve never really thought about this before but how could aluminum airplane wing hold 250 tons in an Airbus A380, for example? There is no way those wings could hold that heavy wright. An Abrams tank weighs between 50 to 60 tons depending on armor package…. do you honestly think each wing could hold two Abrams tanks? Even one of these tanks would sheer that wing clean off! Some thin aluminum structures and pop rivets is not going to hold in a tank. You may have noticed exhaust coming from the rear of the plane when you looked out the window in the gate area. It is from the auxiliary power unit (APU), fueled with kerosene, which is like a mini jet engine, usually located in the back of the plane, containing a compressor needed to start jet engines. Once started, main engines run without propellant. Exalt Wireless has a product called ExploreAir which is a LINE-OF -SIGHT microwave transmission platform. This is a recent press release about a recent installation over water from Beirut to Cyprus. You can skip to the last paragraph and not bother reading it if you like. I had to put it here or the globetards would demand to see it. This product is a line-of-sight microwave link which is basically a straight line over water (The Mediterranean Sea) to a receiver on the other end, 150 miles away. There should be three miles of curvature but this LINE-OF-SIGHT connection is mounted at less than fifty feet on both ends. I spoke to them today to confirm this and didn’t bring up the reason why. I told them I was just impressed with their accomplishment and wanted to learn about the equipment and the installation. It is as advertised, a straight line over 235km of water, point to point, no repeaters. Again, skip to the last paragraph unless you’re technical and interested. Is Flat Earth a controlled disclosure? Flat Earth cannot be debunked because the Earth is flat. I believe global elites are staging a clever controlled disclosure through people like Eric Dubay and duo Mark Sargent and Patricia Steere. It is interesting to note that mainstream media, controlled by Freemasons, refer to them while trying to falsely debunk the stationary and plain earth upon which we live. I also believe some of the so-called “Christian flat earthers” are Masons in disguise. You cannot serve two masters. ABC News Nightline covered the flat earth conference in Cary, NC, held in November 2017. Posted in Flat Earth [in English] | Commenti disabilitati su Is Flat Earth a controlled disclosure? This Student Proves Flat Earth in Geophysics Class. This student was able to completely prove flat earth in Geophysics class much to the awe others. Take a look at the video. Please drop your comment and suggestions, subscribe and share if you enjoy the video. Thank you for watching. THIS IS ABSOLUTELY MIND BLOWING!!! This will totally change your thinking about our earth and how you see it. 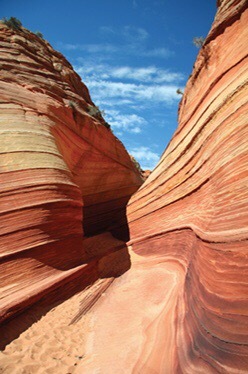 We have seen mesas, buttes, and jagged rock mountains, but we have never truly SEEN them for what they are! Even if you are a Flat Earther, this is going to blow your mind! The pictures speak for themselves, but I highly recommend watching the video link below. 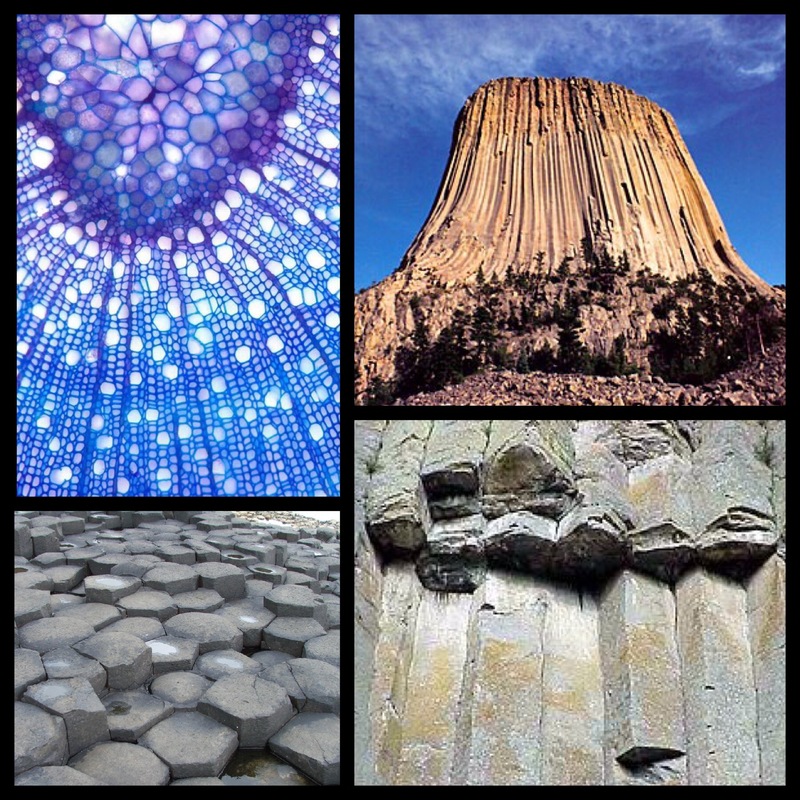 It is fantastic and explains why these large rock structures are not lava formations, but are something much different than we’ve been told. Here is the video that recently came out and is rocking the Flat Earth community. 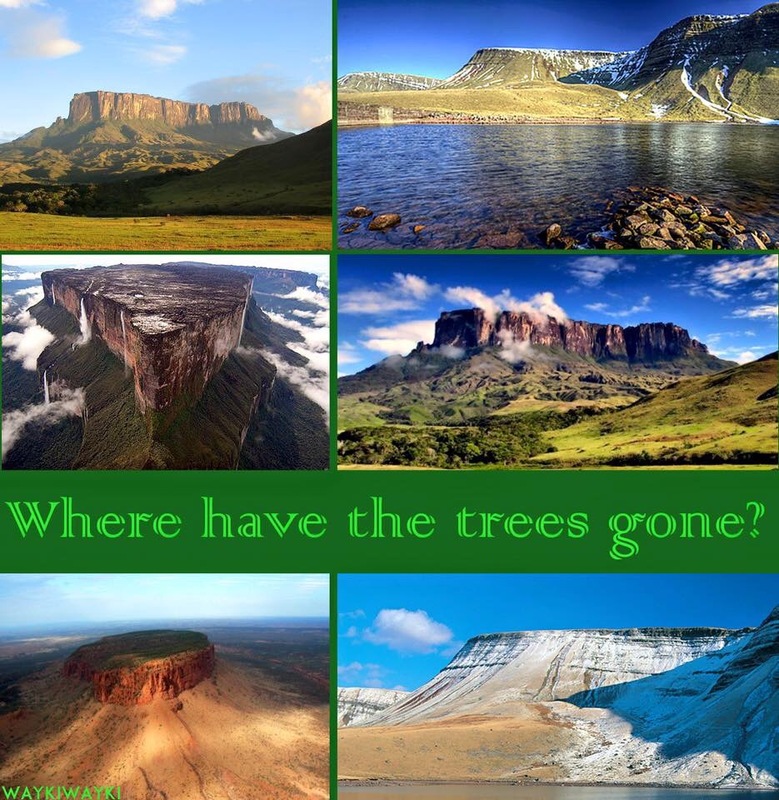 Many assumptions have been made about how trees could have been this large and where they went. 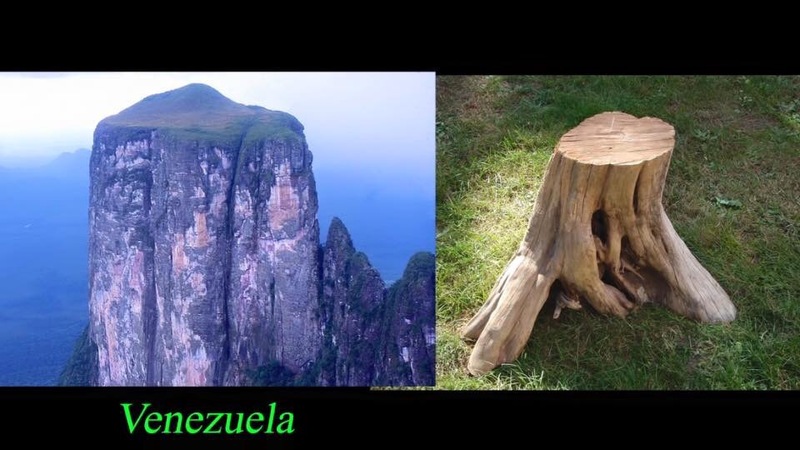 This is a view of these giant tree stumps from a Biblical perspective. 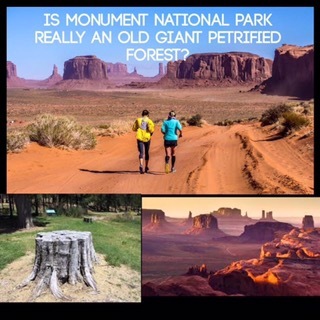 The evidence pointing to these large buttes and mountains being giant petrified tree stumps is astounding. Not only do they look just like tree stumps, but they exhibit characteristics only found in biological organisms and trees. It’s possible these ancient trees were made from silicone and were nearly as hard as stone. An enclosed hyperbaric atmosphere before the flood that was enhanced with carbon dioxide and oxygen would have provided for trees, plants, animals and people to grow VERY large, much larger than anything we see today. Hyperbaric chambers with increased oxygen and CO2 have been successful in growing huge vegetable plants today. The enormous trees were also what helped to create this oxygen rich atmosphere inside the closed flat earth dome. God created a very lush, beautiful world with a variety of large plant life. But these trees didn’t GROW to this height. When God created the world, everything, people, plants, trees, animals, and the earth itself, was created with the appearance of age. God created Adam and Eve in their mature, adult state. These large trees were created in their fully mature state on the day they were created. This destroys the theory that the earth is millions of years old. Our earth is only about 6,000 years old. Very large trees are also described in the Bible in Ezekiel 31 and in Daniel 4. There are several different kinds of giant petrified tree stumps that you will see. 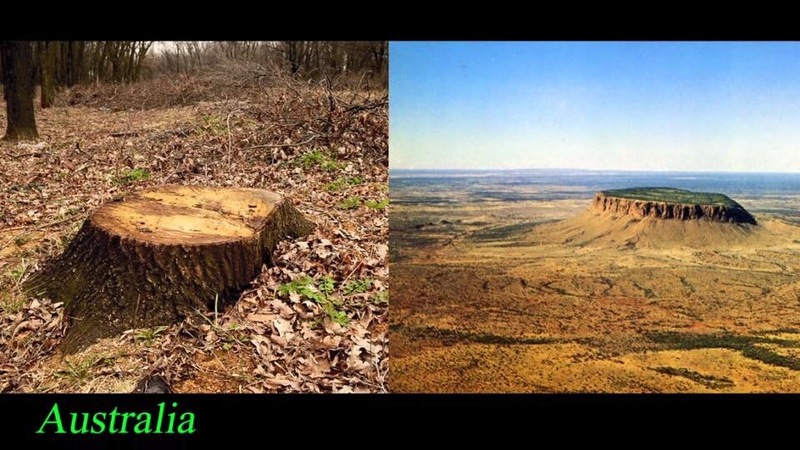 One is the flat-topped Mesa, butte, or plateau that was a tree that was clearly chopped down. 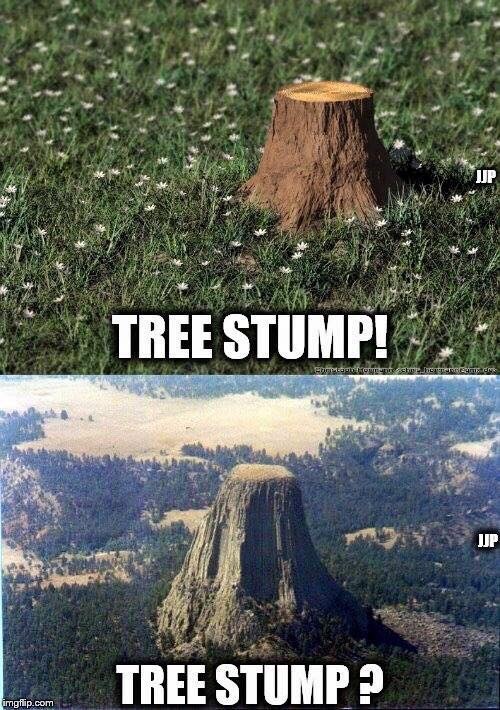 Another type of petrified tree stump is jagged and splintered apart, the result of either the tree falling or being knocked over violently by a strong force, such as a flood. 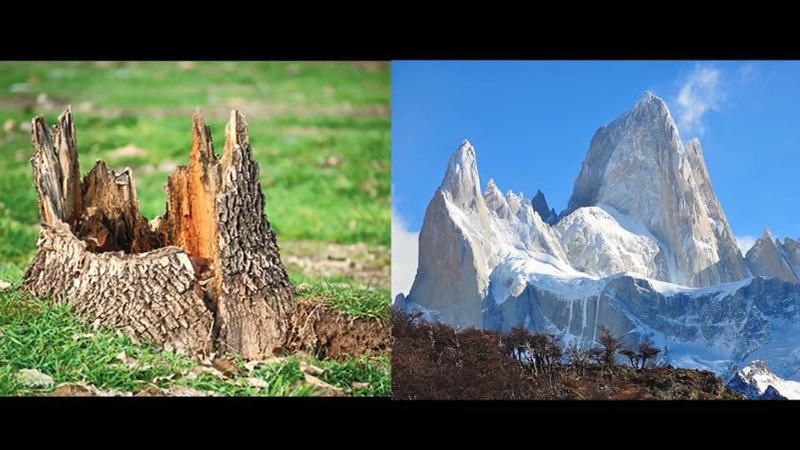 The other type is a tall stump that is rounded or uneven on top which is the result of flood waters tearing off the top of the tree. 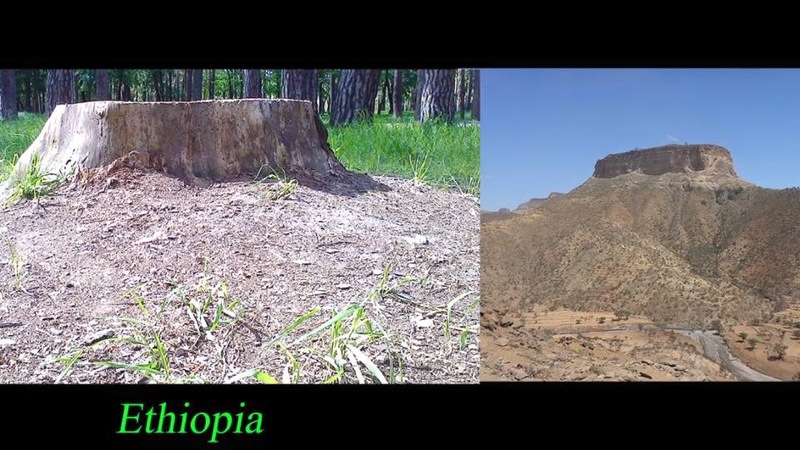 After the flood the atmosphere and terrain was very different giving way to much smaller tree growth and barren lands and numerous deserts. Scientists have explained plateaus away to some volcanic miracle. But if you look close at the evidence you will see that these are indeed very large tree stumps. They are everywhere! The video also discusses massive mining areas and huge quarries that we now call canyons and deserts. Ancient mining and quarries before the flood could have been because of their extreme greed and wickedness. They could have been mining for minerals and jewels to build their giant mansions. And after the flood they may have mined extensively for large stones and gold to build the pyramids and Empires such as Egypt and Babylon. But I believe the flood is responsible for much of the desolation and deserts we see today. Why is this important for Flat Earthers? 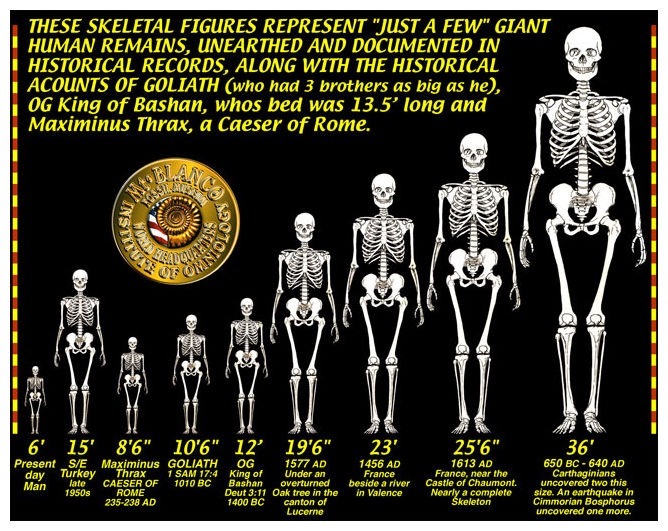 We believe we have been lied to about the shape of the earth because they are hiding God and the true creation. Now we realize they have been lying about Geology too! 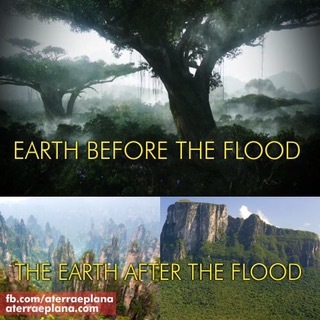 They are hiding evidence of creation and the flood. Our flat earth used to be a lush terrarium, a giant greenhouse, but was destroyed by a flood! The Bible again has proven to be true! We are truth seekers and we want to understand our earth because it points us to reality and the truth about who we are and where we come from. Are deep sea oil rigs giant hoaxes? In chapter 11 of the Genesis, in the Bible, it is written that people started using asphalt instead of stone to pave roads. Is it really possible to pump oil (if it’s there) from the bottom of the deep sea? Aaron has lots of out there ideas. It’s prudent to sift through them to find what you think is reasonable. I’m on board with peak oil being fake. The BP oil “spill” was perhaps fake to “prove” to the world that they are pumping much oil. A very interesting book about what oil and gas are: Thomas Gold: The deep hot biosphere. The myth of fossil fuels. Copernicus Books. Gold is one of the proponents of abiogenic formation of fossil fuels where oil is produced even deeper down in the ground than they claim the current petroleum is found. The theory of black oil residing very deep below ground would very much work in favor of the current system, industry and exploitation methods as well as ensure high extraction prices as oil still would be a “natural” resource. The origin of oil seem full of contradictions and the biggest red flag is that we already produce synthetic oils and gasoline. As a rare “natural” resource, however, petroleum can be sold at higher prices and in a much more reliable manner. We might even finance the base material used in petroleum manufacture as it cost money to get rid of plant waste (bio-mass). It seems like a win-win situation. 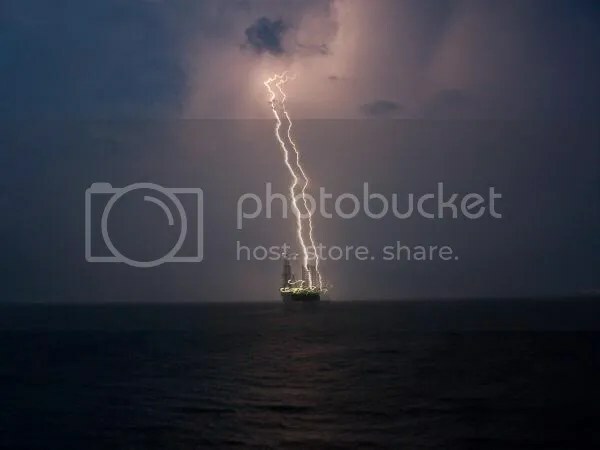 Posted in Flat Earth [in English] | Commenti disabilitati su Are deep sea oil rigs giant hoaxes? I’m sorry to break it to you, but Shaquille O’Neal is apparently a flat-Earther, too. Actually, I’m not sorry at all. I love this NBA narrative so, so much, and I’d like to thank Shaq for breathing more life into it. Soon afterwards, Denver Nuggets wing Wilson Chandler and Golden State Warriors forward Draymond Green endorsed Irving’s flat-Earth theory, with the latter explaining away NASA’s photos of the planet from space by suggesting everyone can manipulate doctored photos of the globe on their phones. The NBA storyline became so outrageous commissioner Adam Silver had to address it in his annual state-of-the-league address at the All-Star Game, clarifying, “I believe the world is round,” and suggesting Irving was making some broader social commentary about fake news in this country. Which, no he wasn’t. Irving doubled down on his flat-Earth theory this past week, before detailing his lucid dreaming skills and informing us how an ex-teammate came to him in a dream to say goodbye. These are all very real things that NBA players have said. Was Gregory Jarvis the only victim of Challenger disaster? We know that all the crew members of the ill-fated expedition of 28 January 1986 have been found alive and well. All keep their names. Minus one: Gregory Bruce Jarvis. 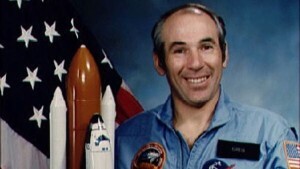 He was an engineer and mission specialist for STS-51L which exploded 73 seconds after liftoff from Cape Canaveral. You can assume that he has not been subsequently identified having changed his name. It is also possible that Jarvis is truly died in the explosion as he was really on board as a space shuttle pilot who, instead of reach the orbit, would have landed at a secret base in the desert. Probably Area 51 in Nevada or other facilities located in uninhabited areas. Jarvis was, indeed, a talented military pilot and on behalf of Hughes Aircraft was embarked on the Shuttle Challenger. It is reported the testimony of an officer in charge of drawing up the user manual of the first space shuttle Enterprise named, that the space shuttle had a spartan cockpit with only one seat. Nothing else. It may be objected that the Enterprise was designed for testing and never intended to fly in space. However, it can be assumed that all the shuttles had on board the only pilot in charge of taking off vertically in front of media before landing in secret like a regular airplane. Some say that shuttle went destroyed each time sinking into the ocean. More feasible, in my opinion, it was reused being huge the cost of producing an adequate copy of the orbiter for every launch. The Jarvis body was the last of the seven to be recovered, three months after the disaster. Maybe because it was the only one to be truly disappeared. In the beginning, NASA stated that all the bodies were together (being restrained by the seat belt) in the cabin … but during recovery operations, Jarvis body was lost again on the seabed. Then Greg was found and his remains brought to surface on April 25, 1986. Curious that his father required from NASA that his son’s body was recovered, unlike the relatives of other crew members. Posted in Flat Earth [in English] | Commenti disabilitati su Was Gregory Jarvis the only victim of Challenger disaster? RIVERSIDE (CBSLA.com) — The hills of Riverside are apparently speaking to us – albeit with a strange message. The words “Google Flat Earth” were found carved into Mount Rubidoux this week in letters that were approximately ten feet tall and visible from the air. An aerial photo posted to social media by the Riverside Police Department’s air support unit showed only the “Google” portion of the message was still discernible as of Feb. 4.While the Riverside Parks Department brought in crews from a CAL FIRE camp in Norco to re-seed the area so the grass can grow and cover up the letters, a man believed to be behind the message reportedly encountered a city employee at the location Monday. He was wearing an orange construction-style vest and carrying a shovel and pick, city parks director Adolfo Cruz told the Press-Enterprise. “The gentleman was telling the staff member that we live on a flat earth,” the report quoted Cruz as saying. Investigators have identified the suspect, but it wasn’t clear whether he would face any charges.